We took E and her cousin to see the Father Christmas play at the Lyric. It’s an hour long, in a small theatre, and geared toward 3-6-year-olds. Perfect. Father Christmas is what they call Santa Claus here, and he was a bit… well, more grumpy old man than jolly old soul. The play didn’t have much talking, mostly visual and physical slapstick-type acting for the kids. Including some toilet humour. They incorporate some puppetry, too. Overall, it was cute, and only cost £10 a ticket. 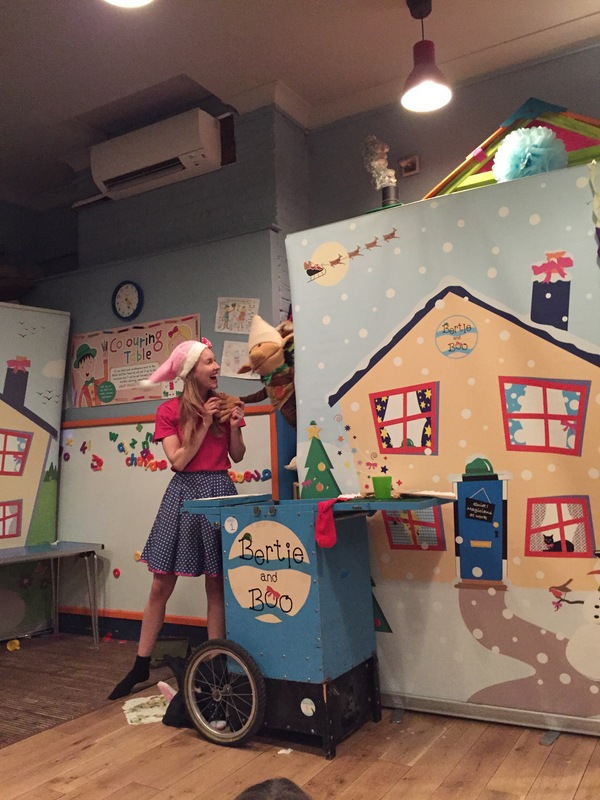 I also took E to a Christmas magic show at Bertie and Boo, our local play cafe. It was half an hour long and the tricks were perfect for wowing her age group. 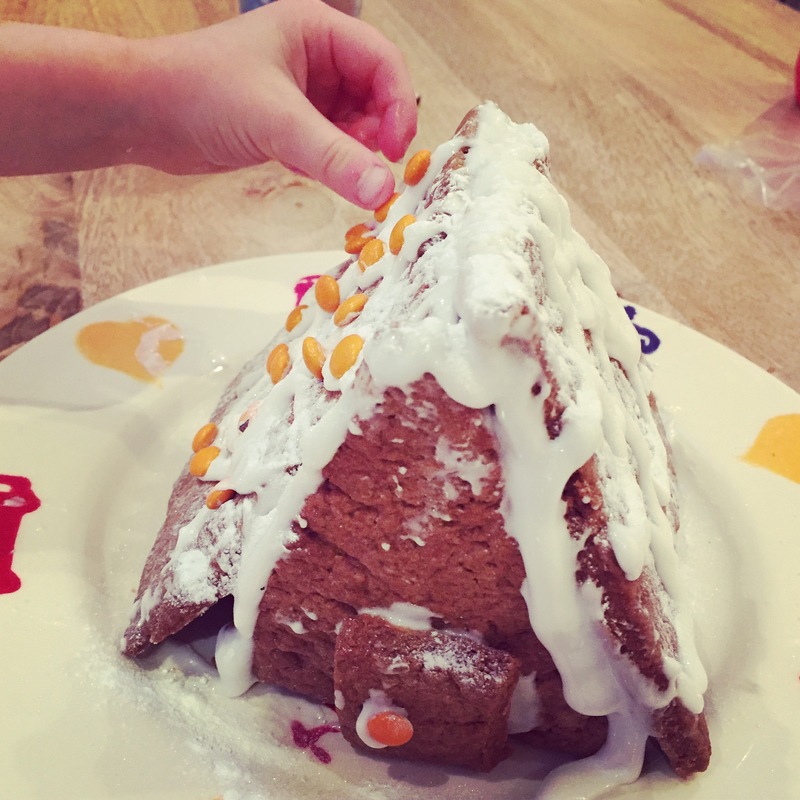 This is what results when you buy a gingerbread house kit for £3 without reading the package instructions and then discover it requires you to make the dough, shape it into the wall and roof pieces yourself, and your helper is 3 and a half years old. Live and learn. Hamley’s is an incredible 6-story toy store on Regent Street. It’s really worth a visit if you are in London with kids; we have gone several times and just let E play there, without even buying anything. There are tons of toys set out and demonstrators doing things, so it’s great fun for kids. But it’s also chaos. Going at Christmastime was absolute mayhem and I won’t make that mistake again. When we went with my brother, sister-in-law, and their kids, it was a nightmare. (Well, I think my brother and nephew were actually in heaven, just wandering around the lower floor which is entirely Star Wars.) The whole place only has two lifts (there are escalators and stairs through the centre), and the toilets are up on the fifth floor. That day, one of the two lifts was out of order. I had the buggy with me so couldn’t use the escalators. And I had a 3-year-old who needed the toilet. After waiting an absurd amount of time for a lift, we finally made it up to the top and there were paramedics attending to a man lying on the floor with electrodes hooked up to his chest. I couldn’t help but think, Yes, that might be the only way out of this place. I spent more time just waiting in front of elevator doors that day than I ever have before or since. After a man scared my child by chasing her with a remote-control Darth Vader and didn’t stop when he saw she was crying and trying to climb my leg, I’d had it. I told him off, waited one last time for the lift, and then when it FINALLY arrived and no one moved to make room for us to get on, when the posted sign clearly read “Priority for Buggies,” I pulled out my loudest, ugliest American voice and informed them that if it is physically possible for them to take the stairs, then they should go do so, held the doors open for myself and jimmied us into the lift. When we got off, someone actually pushed me. So, Hamley’s toy store. Don’t go at Christmastime, just don’t. The Hamley’s Christmas Toy Parade we went to the weekend after Thanksgiving was pretty fun, though.